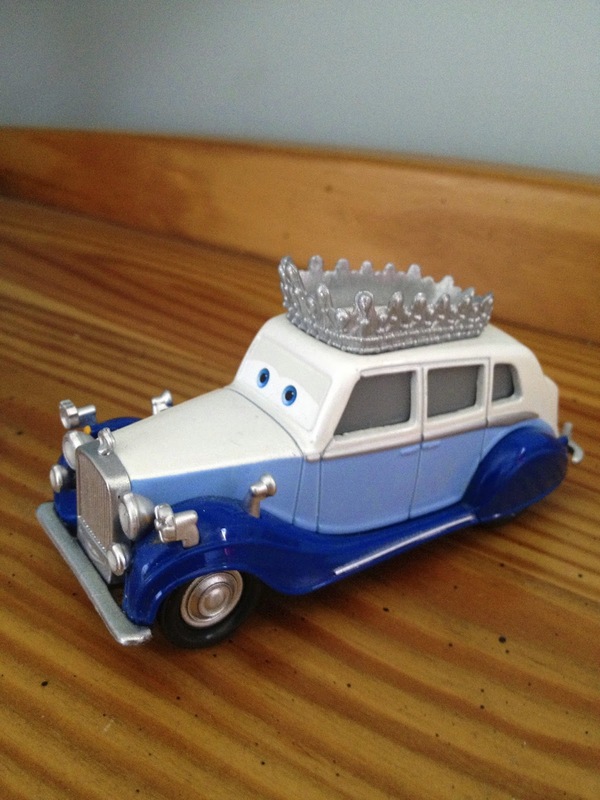 Here's one of Mattel's 2011 Deluxe ("oversized") size vehicles, originally released at the end of the initial Cars 2 line...The Queen! This is 1:55 scale Rolls Royce style car based on the real life Queen Elizabeth II. Fun Fact: Her license plate reads"QEII 1952", referring to the year Elizabeth became Queen of England. While this car was not a "chase" edition release, it sure felt like it. I never was able to find her in stores and she was known to be one of the rarest to find in that year. This one was an eBay purchase from a while back (yup, had to resort to buying her loose for affordability). If you had trouble finding this one as I did, you can pick her up on Amazon (currently still pretty high up there at $24.99), or on eBay using the link below. Note: If you go to buy this loose on eBay, double check to make sure you're not buying the Disney Store 1:43 scale version, as it's sometimes hard to tell the difference.